The best flaky pie crust recipe without shorenting is straight from my Great-Grandma’s kitchen. I do not make this claim lightly. Let me ask you this. Do you ever eat a pie and fork out the filling, leaving the crust behind? Because if you are said yes, you my friend have been using the wrong recipe. In less than 15 minutes you can have 4 crusts (this a double pie crust recipe, meaning you’ll have enough crust for 2 tops and 2 bottoms of an 8 or 9 inch pie plate) ready to bake or freeze and this crust is so good, you’ll be leaving the filling just to eat the crust! In fact, my seven-year-old did that tonight. When I was little, we made the hour trip to go visit my great-grandmother. We didn’t get to go very often, but I remember her house and beautiful rose bushes even though I was quite young. My mother is an excellent baker and cook, but I never liked pie crust. Until I tasted this one. 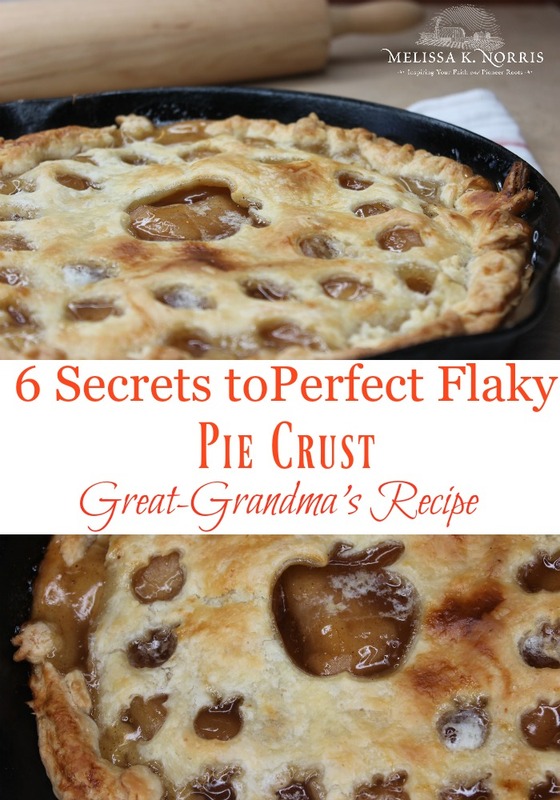 I had never eaten pie crust before and when I ate the entire piece of pie, crust included, my mom switched her recipe as fast as my great-grandmother could write it out. Now I’m thrilled to share it with you. Be warned, this flaky pastry pie crust recipe is the best I’ve ever had. Like melt in your mouth going to eat the entire thing in one sitting, so grab a big ol’ fork. 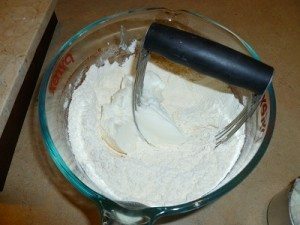 Are you looking for a pie crust recipe without shortening? If you’re concerned about GMO foods and ones that are highly processed, then the answer is yes. I cut shortening out of our kitchen after a cancer scare almost ten years ago and have never looked back. This became my no fail flaky pie crust with butter, because let’s face it, real butter just makes everything taste better. For real, I’ve even been known to slip it into my coffee come morning. And contrary to popular notions, I’ve not packed on the pounds. But now worries, if you’re dairy free, you can make this pie crust recipe with lard or coconut oil. Great-grandma knew a thing or two about baking and one of those was the addition of two special ingredients not always found in common pie crust recipes. These two items make this a foolproof pie crust with vinegar and egg! I know, the vinegar may throw you, but trust me, together, they make a world of difference in both the flakiness and ease of working with the dough. Homemade pie crust doesn’t have to be hard or take a lot of time. Get these tips from over 3 generations of bakers in my family to create delicious melt in your mouth pie crust, every time–> Click here to subscribe. Find old-fashioned cooking for a busy home without spending all day in the kitchen, get more recipes (over 100) like this flaky pie crust recipe and flaky buttermilk biscuits in your copy of Hand Made: the Modern Guide to Made-from-Scratch Living. Psst, don’t forget to claim your bonuses here. 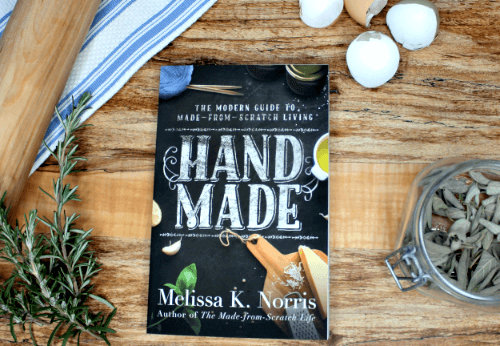 This recipe is in Hand Made: the Modern Guide to Made-from-Scratch Living, along with other old-fashioned family favorite recipes (grandma and great-grandma’s, because those ladies could cook), frugal and self-sufficient tips. Mix flour, sugar, and salt. 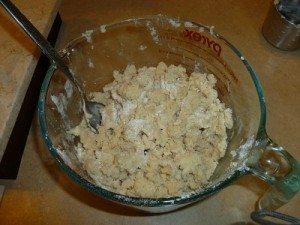 Cut in lard, butter, or coconut oil. Note: In order to achieve flaky crust, your lard, butter, or coconut oil needs to be cold. It’s the pieces of solid fat distributed throughout the flour which melt upon baking that create the flakiness. Chill for 15 minutes. 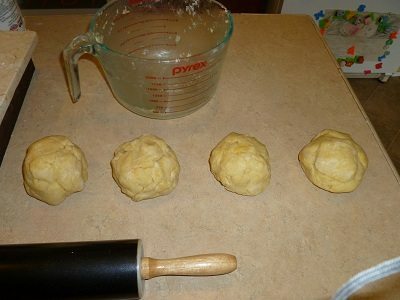 Take out dough and divide into four equal balls. Wrap and freeze for later use or roll out and bake your favorite quiche or pie. I love this paired with a jar of my home canned apple pie filling for a quick from scratch dessert. If you’re not baking today, take unbaked pie dough ball and wrap in plastic wrap. Toss in freezer. When ready to use, thaw flaky pastry crust dough in fridge overnight or on the counter for a few hours. Lightly flour surface, flatten dough ball with hand, and then roll to desired thinness. It was edible, but not a mistake I’d like to repeat! Mix flour, sugar, and salt. Cut in lard, butter, or coconut oil. Note: In order to achieve flaky crust, your lard, butter, or coconut oil needs to be cold. It’s the pieces of solid fat distributed throughout the flour which melt upon baking that create the flakiness. You can freeze your butter or lard before cutting it in. The large side of a cheese grater works great with frozen butter. Fat is fully cut in when the flour is crumbly pea size pieces. Add in liquids until dough just holds together. You don’t want to over mix it. Chill dough in the fridge for 15 minutes. Use to bake pies or separate into four equal balls, wrap, and freeze.
. There you have it the best flaky pie crust without shortening, aka foolproof pie crust recipe with vinegar. Let me know how it works for you and if you’re now a gimme the pie crust first pie eater?